Shipping weight = 43.90 lbs. 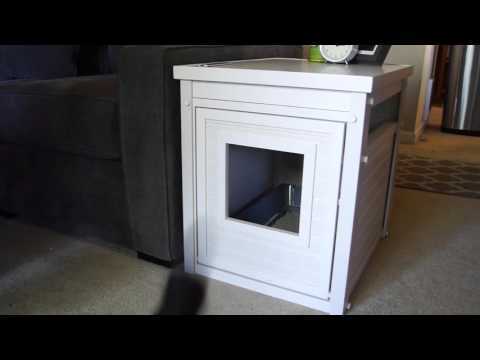 The New Age Pet Litter Loo Litter Box Cover and End Table is a stylish and sensible way to camoflauge your cat's unsightly litter box. The Litter Loo is constructed from eco-friendly ecoFLEX and features a fold down front door for easy cleaning and side vents for proper ventilation. The cover comes in an antique white color that will go great with any home decor. Purchase two and use as end tables, one as a litter box cover and one as an enclosed pet bed. The ecoFLEX material is a blend of recycled polymers and wood byproducts which exhibits the best characteristics of the polymers and wood that forms the basis for the material. ecoFLEX based products outlast similar product by 2 to 1 or even 3 to 1 in extreme climates.